The Strait of Hormuz is one of the most strategically important stretches of water on Earth. Though just 47km wide, it accommodates the passage of 20 per cent of the world's oil. Were Iran to plant sea mines there (again), global trade would be severely affected. Luckily, the Strait is defended by the Avengers — not the superheroes, the mine hunters. 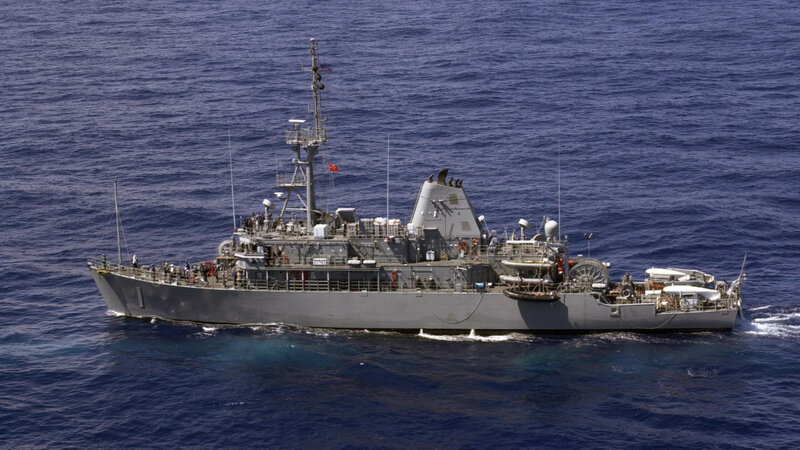 Officially known as Avenger-class mine countermeasures ships, the US Navy has built 14 such boats between 1987 and 1994 and deployed them around the world to protect vital waterways. Built by Peterson Shipbuilders of Sturgeon Bay, WI, and Marinette Marine of Marinette, WI, these ships measure 68m long and rely on wooden hulls — typically oak, Douglas-fir or Nootka Cypress — coated in glass-reinforced plastic. This reduces weight and lowers the magnetic signature of the vessel (preventing the activation of any nearby magnetic mines) while still providing a durable boat-bottom that can withstand the shockwaves from nearby detonated mines. A team of four, 600hp Isotta-Fraschini diesel engines propel the 1190-tonne boats and their compliment of 84 crew members at a pokey 14 knots. Sure, that's only 25km/h, but racing top-speed though mine fields generally isn't recommended anyway and makes actually finding the mines (with something other than the bow of the ship) more difficult. When searching for mines, the Avengers employ the AN/SQQ-32 advanced minehunting sonar, built by Raytheon and Thales Underwater Systems. This system deploys a pair of sonars from a submersible pod towed under the ship. Search and detection duties are handled by Raytheon while the high-frequency, high-resolution TUS sonar helps classify what sort of mine it is. Then the fun starts. Once a mine field has been identified, the Avengers can either perform a conventional mine sweep — basically dragging a wire through the water to cut the mooring wire of floating mines — or they can deploy the AN/SLQ-48 remotely operated vehicle. This ROV is designed to detect and detonate both floating mines and those resting on the seafloor. 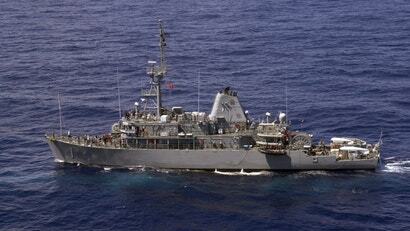 It employs high-frequency sonar (like the TUS system) as well as low light level television (LLLTV) to find the mines. The ROV can then either cut the mine's mooring cables or detonate it underwater using a high-explosive charge. While the AN/SLQ-48 does remain tethered to the ship, its 1066m umbilical allows the mothership to remain a safe distance from the action. Unfortunately, these ships tend to see a lot of action. After the class's initial deployment in 1987, they were employed extensively throughout the Persian Gulf during the Iran-Iraq War, then again during Operations Desert Shield and Desert Storm. Now, as tensions with Iran rise again, Avengers are being sent back — again. Four additional Avengers are being shipped to the Gulf (aboard the MV Tern — a smaller version of the MV Blue Marlin) to joing the Fifth Fleet in Bahrain, bringing the total of mine-sweeping vessels in the region to eight.